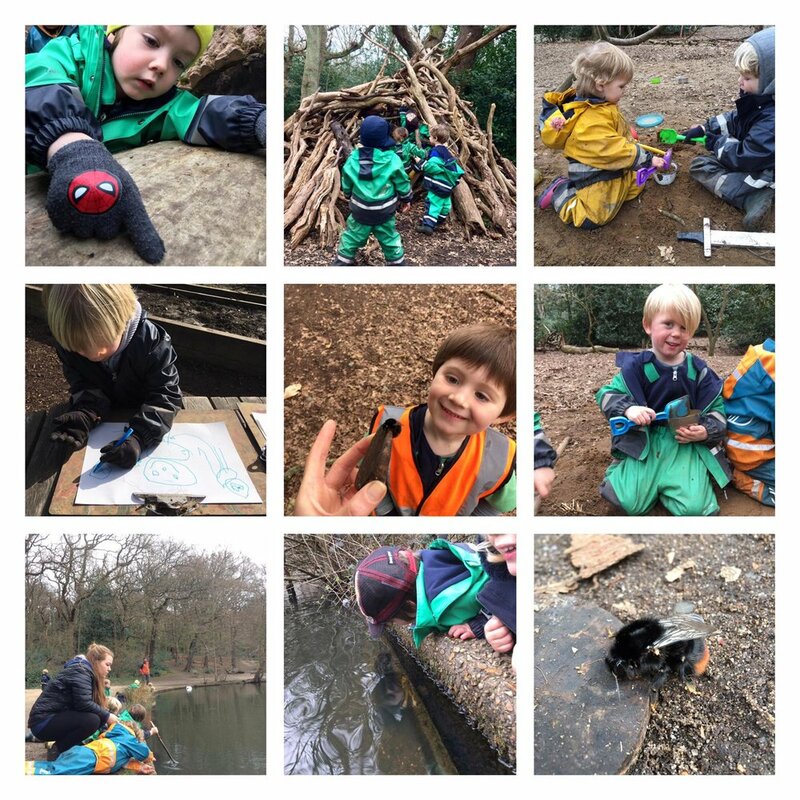 We’ve had another lovely week in the forest and, although it may seem obvious, nature has played a very significant role in the learning this week. On Monday, the honey bees at Paradise were busier than usual, and at one point had an intruder in their nest as the hive became much livelier and more animated than we had seen before. We cordoned it off so the children could watch in amazement from a safe distance as the black swarm buzzed around it’s hive. We discussed what might have made the bees react how they had, what goes on inside a beehive and how they make honey. We learnt that in their 6-8 week lifespan a worker bee can fly the equivalent of 1 and a half times the circumference of the earth and a queen bee can lay 2000 eggs per day. ‘Busy as a bee’ suddenly has a whole new meaning! While at the Windmill we ventured to the lake where we looked for frogs – and saw loads of them! The children seemed to lose all track of time and snack was almost completely forgotten about as they lay on their tummies to watch the frogs dart back and forth under the water. The piggybacks they were giving one another provided a more challenging teaching point, but for now we decided to go with just that – piggybacks. The children have seen our forest go from bare leaf-less trees and ground that is muddy and soggy underfoot to a forest that is now full of buds and blossoms and where animals are starting to appear again. Bees were not only centre stage at Paradise, but when a tired bumblebee buzzed in to base camp and sat down for a rest the children were all so intrigued as to why it looked so different from the bees at Paradise. We then discussed wasps and hornets and how they can all look quite similar, but all have different roles within our ecosystem. When animals weren’t the main topic on our agenda, the children enjoyed; making musical instruments, reading stories, building mini theme parks and getting lost in the wonder of their imaginations. All in all, what a wonderful week in the forest for us!